I don't often undertake multi-day projects. HOWEVER, my oldest niece graduated from Brigham Young University this week (the first of the next generation to finish college! Yay Megan!). Her father (my brother) asked if I would be willing to make a cake for the party in celebration of her graduation. Do I pass up such an opportunity? No! Do I have the tools and know-how to make a cake that will serve 40+? Again, no! So, I resorted to making cupcakes. A mountain of them. It was fun to do a project of this magnitude. Although, it made me wish for an industrial-sized kitchen. And a kitchen staff. And a dishwashing crew. And catering equipment. And a catering truck. 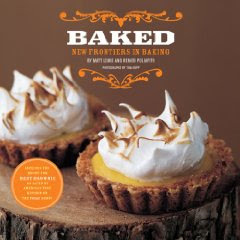 in this book and decided I would shamelessly and blatantly steal the idea from the brilliant bakers who wrote this cookbook (which is quickly becoming my favorite). The original recipe is for "Almond Green Tea Cupcakes". However, I wasn't sure how many members of my family would be into the Green Tea flavor of the frosting. And, some of the kids are allergic to nuts. So. This was my plan: bake a couple batches of Chocolate Buttermilk Cupcakes (thanks, Fannie Farmer, you always come through), bake a couple batches of Almond Cupcakes, make a batch of their Buttercream frosting without the Matcha powder, and finally, make a batch of their Milk Chocolate Frosting (part of the Milk Chocolate Malt Ball Cake recipe--yes, I'll be making that, never fear)--then--mix and match. Some almond cupcakes with buttercream frosting, some with chocolate, etc., you get the idea. Then top them with fortune cookies dipped in either semisweet or white chocolate. If I had gotten the idea sooner, I would have ordered custom designed cookies with the fortune of my choosing inside. It would have said something like: "Congratulations Megan! A prosperous future awaits you!" But, I am not thinking very far ahead these days. So. I bought fortune cookies and printed out additional "fortunes" for the occasion to slip into the fold of the cookies once they're placed on the cupcakes. Yes, thank you, sometimes I AM clever. And here's how it went: First of all, sometimes I fill cupcake papers too full. So when I multiply a recipe that should make 24 by half again, I get 22 cupcakes instead of 36. Ah well. I made another batch of that one. The recipes in Baked, however, consistently prove to be outstanding. I get exactly the expected results, if not better. And, every recipe of theirs that I've used is incredibly delicious. Their Buttercream recipe, people, is pure genius. They have variations of it in different recipes (Cinnamon Buttercream for the Red Velvet Cake, Green Tea Buttercream for the Almond Cupcakes), but even without any other flavoring, it is incredible. Light and buttery and sweet and, yes, I dispensed some directly into my mouth from the frosting tube (after finishing the frosting, naturally), it's that good. 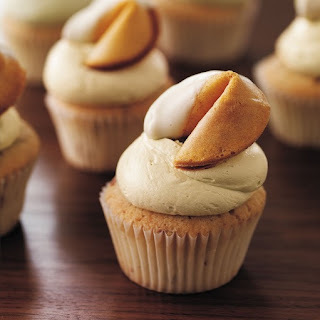 I really want to try the Almond Cupcakes again with the Green Tea Buttercream. I imagine they're Zentastic. Their Milk Chocolate Frosting is probably the richest "milk" chocolate anything I've ever tasted, and hence, very, very good. The combination of that on the Almond Cupcakes wasn't my favorite thing. The Almond Cupcakes are so light and subtle that they were sort of overpowered by the chocolate. But that's my bad. These smart guys probably would have told me not to go there had they been standing in my kitchen with me. I have struggled for years with how to get the cupcake batter in the papers without it dripping all over the place (cake batter is generally a little on the runny side). But I came up with what I thought was a brilliant solution (you guys have probably already been doing this for years)--an ice cream scoop with release lever! I was able to get out just the right amount, scrape the bottom of the scoop along the edge of the bowl to avoid drips, and then release it right out into the cupcake paper. Brilliant! And the cupcakes were a hit! Some of the kids even had two (and ate the cupcake, not just the frosting), which is always the sign of a good dessert. Even so, there were lots left over (which is a good thing--cupcakes for breakfast--why not?!). And look how beautiful! Almost as good as the picture from the book. Next up: It's mr.'s birthday next Saturday, so I'll be making a birthday cake of some kind. I'm guessing there will be chocolate involved. I have to consult with mr. on exactly what he wants. And I will happily bake it to celebrate the birth of my dear husband. HOT. These look awesome. I want that book! I wish I could have been there to help you!! Thank you! Thank you! 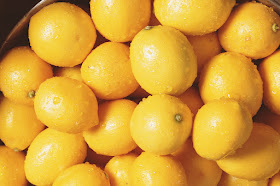 They were delish. I especially liked the chocolate/chocolate. Can't get enough of that good stuff! I've found those "ice cream scoops" to work great for everything except ice cream. The ice cream is always either too dense or too frozen and the release mechanism either breaks or the handle hurts your hands.